Home / Articles and Stories by Njkinny / Articles by Njkinny / Contest / Indi-Happy Hours / IndiBlogger / #TheGreatIndianLitterbug ~ Men and women on a mission! #TheGreatIndianLitterbug ~ Men and women on a mission! "Ever seen #TheGreatIndianLitterbug in action?" I was asked. I smiled at this question because who hasn't seen them? They are everywhere and always active because you see, they are on a mission. A mission to mark each and every corner of the world as their own and they are even teaching the next generation the tricks of the trade! I see one such Litterbug everyday as I wait for the bus to my office. He is a nondescript, average man with a balding head and a protruding belly who is always there before me, waiting for a bus, I guess because he is still there when I board mine. So he sits eating something or the other with a small boy and each time that supposed eatable is finished, he gestures to the small boy who then throws the wrapper or the peal as the case maybe, on the road. This ritual is again repeated the next day and then the next. No amount of censure from your side can deter him in his mission because according to him, the road gets cleaned everyday because he is littering and so he is helping get the road's cleanliness be maintained! Weird logic but he staunchly believes it. There is another litterbug in my colony who pretends to be a social worker when he urinates at the side of the road in the narrow flower beds. Chewing pan masala, he is the local gardener and if you see a red stain on your walls or near your car when you go to open it then don't worry, it signifies that our friendly, neighbourhood Litterbug has been there! When scolded for his actions, he is ready with an explanation. By urinating in the flower beds, he is providing them natural fertilizer and if some walls get stained by this then that cant be helped! Also by spitting pan masala he is helping the people remember to get their walls whitewashed and thus, helping them keep their houses beautiful! I have no words for this logic. Do you? We see so many Litterbugs going about their work. They are always happy, always smiling and never take offense when you rebuke them. They have perfect explanations for their actions. My dear Surili Aunty from the first floor flat is so understanding when she throws her garbage from the first floor, thus, facilitating the garbage collector who doesn't have to climb the stairs to fetch it! So what if a few things fall in our yard, atleast she saved the garbage collector from the unnecessary hassle! We are surrounded by these Great Indian Litterbugs who are always at work. They start early, they work till late, they never rest, they never complain and they can always be recognized by their confidence. They litter with confidence and they are always ready with an answer to your every question! No amount of debate and lecture can deter them from their holy path because they are not ordinary, they are #TheGreatIndianLitterbug! 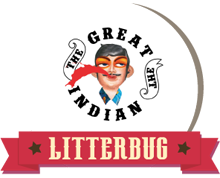 This post is written as part of the Indi-Happy Hours for #TheGreatIndianLitterbug campaign by The Times of India in association with Indiblogger.